Scientific studies have shown that certain aspects of breathing can be improved through respiratory training. This is the basis of one of the articles I’ve posted on breathing on this site. 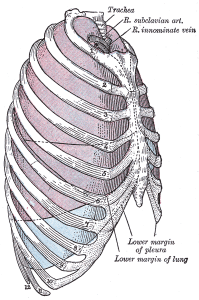 The underlying physiological concept is that the respiratory system contains skeletal muscles that can be strengthened just like any other skeletal muscles in the body; these are the muscles that drive the respiratory bellows (the lungs themselves containing no muscle, of course). Based on these and other studies, I have decided to try a little experiment, using my own breathing measurements. First, measuring 30 vital capacity maneuvers per day for 3 weeks, using a spirometer. Second, measuring 30 PEF/FEV1 (peak expiratory flow/forced expiratory volume in 1 second) maneuvers per day for 3 weeks, using a digital PEF/FEV1 meter. Third, combining both 30 vital capacity maneuvers and 30 PEF/FEV1 maneuvers (a total of 60 measurements per day), again measuring daily for a 3 week period. Vital capacity, by the way, is a person’s usable, voluntary lung capacity. Peak expiratory flow is how fast a person can exhale air. Forced expiratory volume in 1 second is how much air can be moved in one second. All three of these measurements would seem to have applications for wind musicians. This is not a tightly controlled medical experiment, of course–it is just slightly better than anecdotal. However, I was curious to see what measurable benefit I might personally experience. Essentially what I’m trying to see is whether an active professional wind musician can make similar improvements to those that have been made in the studies on “normal” subjects. I am in the middle of the process, just finishing up the third week of PEF/FEV1, and it looks fairly promising. The vital capacity measurements were especially surprising: in the course of 3 weeks, I improved from 6.6 liters to 7.2 liters, a fairly significant increase. I’ll post updates as I finish the PEF/FEV1 phase and the combined phase. Eventually I’ll post a summary of everything and discuss what possible conclusions can be drawn! Sorry about the delay in my response! I used the Buhl spirometer shown in this article. I also used an electronic PEF/FEV1 meter.